ABC and Marvel's Agents of S.H.I.E.L.D. season 3 continued to develop the storyline of Inhumans hidden on Earth, as well as delved into the origins of Hydra and their connections to a distant planet. The midseason finale concluded many ongoing story threads, set up certain new plots, and left viewers on a cliffhanger. While Agents of S.H.I.E.L.D. is on break, ABC is gearing up to premiere the second season of Agent Carter, featuring the original Marvel team at the Strategic Scientific Reserve, including Peggy Carter (Hayley Atwell) herself. 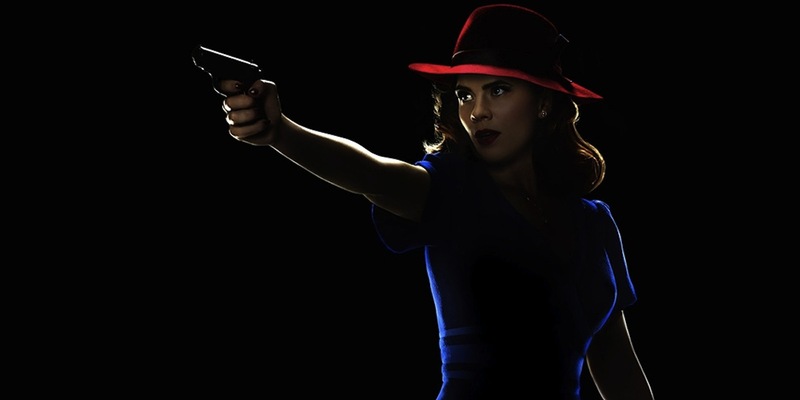 In order to generate excitement for Peggy's sophomore season, ABC has rolled out a full-length trailer, a handful of TV spots, and a new noir-style poster featuring the titular heroine. Now, the showrunners have offered new details about a season 2 episode that confirm the return of a fan-favorite character. Additional details for season 2 of Agent Carter come from EW, which is reporting that Lyndsey Fonseca (Nikita, How I Met Your Mother) is returning as Angie Martinelli, Peggy's civilian friend from New York City. According to executive producer Michele Fazekas, Fonseca will appear in a dream sequence at the beginning of episode 9, following a cliffhanger at the end of episode 8 that sees Peggy and Edwin Jarvis (James D'Arcy) left unconscious. Further explaining the dream sequence, Fazekas says it will begin in black and white, then transition into color, and feature a Broadway-style musical dance number. The song was created by lyricist David Zippel, who wrote "Star Spangled Man" for Captain America: The First Avenger, and Christopher Lennertz, the primary composer of Agent Carter; additionally, the duo worked with Fazekas and fellow executive producer Tara Butters. The scene was choreographed by Louis van Amstel (Dancing with the Stars) who will appear along with a number of other dancers from the hit ABC reality competition series. It may seem strange for Agent Carter to include a song-and-dance number in its series at all, but the show's second season will be set in Los Angeles and the major antagonist, Whitney Frost a.k.a. Madame Masque, has been described as "a Hollywood actress." So, it's likely this dream sequence will make sense within the confines of the season 2 storyline. Plus, contributions from the series' composer and fellow Marvel collaborator Zippel will likely help the sequence to fit within the tone of the show. That being said, fans are likely to be more excited about the return of Angie, whose whereabouts in season 2 have largely gone unmentioned by those close to the production. Though, with Peggy in Los Angeles, and Angie presumably still pursuing her acting career in New York City, it seemed she wouldn't appear at all. Still, although Fonseca won’t be returning for a large part, Angie's brief appearance in episode 9 may offer some ties between this season 2 storyline - which Fazekas is vague about, likely to avoid spoilers - and what went on in season 1. Of course, that remains to be seen when Agent Carter premieres in January.